The great thing about the Jeremy Lin story is that it’s not manufactured. It’s real. And as a result no one quite knows what to make of it. Cooler heads keep trying to prevail. Telling us it won’t last and that we should dampen our enthusiasm. That Amare Stoudemire and Carmelo Anthony, his high profile teammates, won’t be able to play with him because they’re too egotistical. That may be true, but there’s nothing like a perfect pass delivered exactly where you want it so you can score to stroke the ego. That he’s played well but has too many turnovers. Never mind that his turnover percentage, according to Newsday Reporter turned MSG commentator Alan Hahn, is actually lower than four of the league’s five assist leaders, including the vaunted Steve Nash, himself a Lin fan. What’s truly incredible about this story is that it is in fact, a story. In a time when, especially in sports, not particularly interesting stories are rehashed and rehashed every night, and spectacular moves are made commonplace endlessly rebroadcast on ESPN’s sportcenter. Lin’s is a story that no one can turn cliché. So we have to keep tuning in. And not only has Lin come from nowhere (Harvard, as Stephen Colbert so perfectly put it), he’s brought others with him. Landry Fields, who had been given up for lost. Jared Jeffries, who now anchors a very eager, very active second unit. And Coach Mike D’Antoni, whose propensity to allow his team to play rather than militaristically micromanaging them now seems like genius again. The truth is that a recurrent theme in Lin’s wins has been his beating elite point guards by doing a better job of setting up his teammates. And then, when all seems lost, displaying a surprising killer instinct. What’s different about Lin is he’s different. He doesn’t fit into categories. He does what’s necessary. And he has figured out how to be the glue on a team that was supposed to be New York’s answer to the Heat. 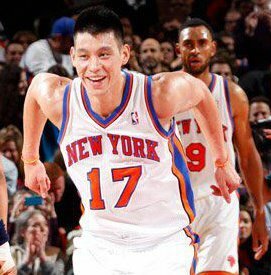 A word about that: what the emergence of Jeremy Lin means is the sudden DeYankeefication of the Knicks. It means they are not the best team money can buy. They are that plus luck: they are that plus accident. They are true to the spirit of John Starks, who might otherwise have been bagging groceries instead of dunking over Jordan and Pippen at once back in the nineties.